Thank you for supplying us with the adults only fools and horses bouncy castle at the weekend, your staff were also very helpful and friendly I will be using you guys again.thanks doris. I got the Rodeo Bull for 2 hours with the mickey slide green combo deal and it was a great deal that it was on, I would like to thank the company for great service I will be telling everyone about how great you are. Will be using DJ Land of castles again. 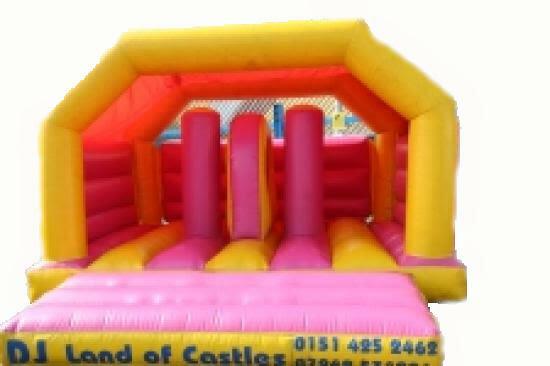 Our 15ft x 15ft Pink Activity Bouncer Castle is lots of fun as it features bish-bash pop up that the children love,this bouncy castle is very popular with young children.This Activity bouncer bouncy castle has a raincover so whatever the weather you can still have fun on our Activity bouncer bouncy castle.The required space you will need is 17ft x 17ft,the height of this bouncy castle is 12ft.If the bouncy castle is going indoors,please ensure the celing height of the venue where the bouncy castles going is higher than the bouncy castle.We deliver our themed bouncy castles, inflatable slides,rodeo bull hire,plus are assault courses and adult bouncy castles and domes,to Merseyside & Liverpool, Widnes, Runcorn, Wirral,Warrington, and St Helens, and some of these areas and further areas will be a additional fuel charge or toll/tunnel charge.Check our delivery checker on our home page,it will tell you if there is a charge for your area.